Welcome to Lake City Rental! We have 2 convenient locations to serve you in Hayden & Coeur d'Alene ID. With over 75 years of experience in Equipment Rentals and Event Rentals, let Lake City Rental’s knowledgeable staff help you with all of your rental needs. From homeowner to commercial contractor rentals and backyard BBQs to elegant weddings of 500 guests, we will provide top quality, well maintained equipment, along with professional service every time. 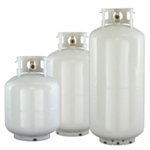 We fill vehicles, RVs and propane tanks of all sizes. Stop in today at our Hayden & Coeur d'Alene ID locations. We stock a large selection of name brand quality equipment and keep it well maintained and serviced. Our knowledgeable personnel can assist contractors and homeowners with any equipment rental needs. We are locally owned and operated, which means we give you personal service and you can rent with confidence. If we don’t have what you are looking for, we will help you find it. Let our professional event staff help plan your next event. 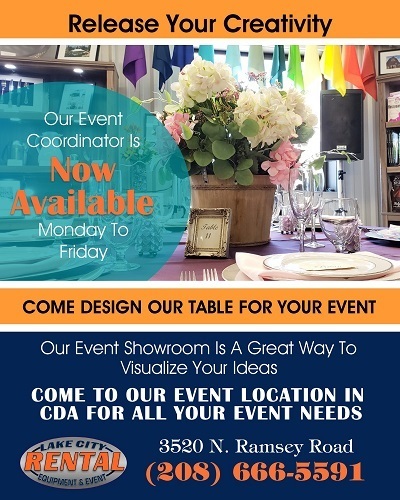 They can help you choose from our extensive selection of tents, tables and chairs, linens with a wide array of colors, place settings for up to 500 guests, concession items, bbq grills, and inflatables, just to suggest a few. We facilitate corporate events, banquets, weddings and back yard parties, whatever you dream up!